This craft was a bit of a collaborative effort between me and my 22 month old daughter. I’d originally planned on making this with my (older) son but he didn’t fancy it (and I don’t believe in forcing them to make things) where as my daughter started squeeking and pointing when she saw the black paint come out. This is exactly why I always try and buy washable paints! I let my daughter paint as much of the paper plate black as she fancied and she had a great time squishing the paint around with a brush. Most of it was on the plate rather than the dinning table too which made a nice change! While she was doing this I cut out two ears and a nose from some black card and the white middle area of the face from some white paper. When she’s finished painting we folded in the sides of the face to make the white outside edges and glued these down. One of the benefits of this is that if your child has only painted a bit of the plate (as my kids often do) you can move the plate around accordingly so that as much painted area as possible will show. 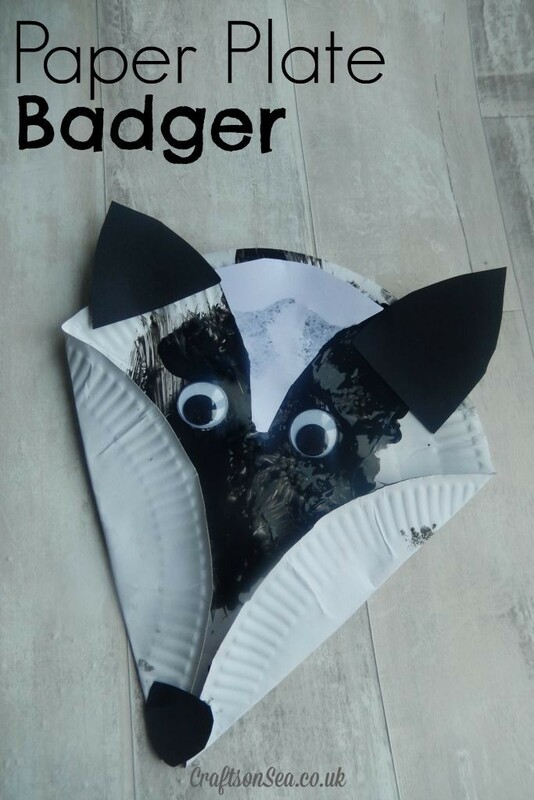 We then glued on the eyes, ears and his nose and our badger was complete – I’m pretty fond on this little fellow!